We may need to add a chapter to President John F. Kennedy's book, Profiles in Courage. 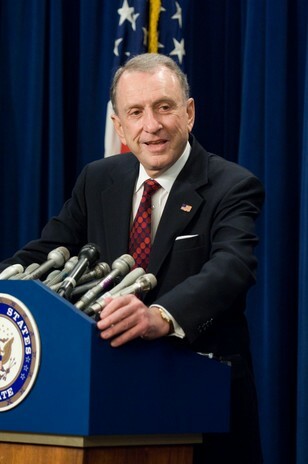 This new chapter would be to honor Pennsylvania Senator Arlen Specter. Every once in a while, a member of the U.S. Congress distinguishes himself or herself by doing the right thing, regardless of whether or not it will help secure a primary election or general election win, regardless of whether or not it would be the best thing for the political party he or she belongs to. Senator Specter, along with two brave Maine Senators, Susan Collins and Olympia Snowe, stepped up to the plate, defying the Republican game plan, which was to stand firm and corral every single Representative and Senator and have them vote against the Stimulus Package. This philosophy worked in the House of Representatives, as there was not one brave Republican soul who dared to vote his or her conscience, even though it seemed as if every single economist and financial advisor, from the left and from the right, from both political parties, had been advising, pleading, that in these dark days of bank failures and massive lay-offs and the impending doom of the American automobile manufacturing industry and newspapers folding from coast to coast, that something had to be done. To do nothing was to invite Depression. But Speaker Nancy Pelosi, with her Democratic majority in the house, was able to pass the Stimulus Package without a single Republican vote. Then all attention focused on the U.S. Senate. And that's when Senator Specter distinguished himself by speaking up and speaking out on behalf of President Obama's plan to kick-start the ailing, failing American economy. Working in tandem with Collins and Snowe, Specter was an articulate and convincing spokesman for the bail-out bill. The right-wing radio talk-show hosts were busy doing a hatchet-job on Specter one afternoon recently, so I jumped on my cell phone and called in to support the Stimulus Package and to praise Specter for his courage in pushing the bill forward. Now everyone knows that I am a liberal Democrat, but I admire elected officials who do what's best for the country and their constituency, even if they risk being thrown out of office for their courageous acts. The funny thing is - all the Democrats whom I surveyed, informally, admire Specter for what he did. But the Republicans? They are griping and sniping and threatening to support a real right-wing Republican against Specter in next year's primary election. So far I haven't noticed that the Republican party is in favor of anything. But they certainly have made it clear that there is a long, long list of things which they are against. And it has very little to do with schools and early childhood education and bridges and deferred maintenance costs for universities and jobs jobs jobs and foreclosure. Specter, however, looked carefully at the big picture, saw disaster looming, and decided to do the right thing. The head of the local cable access station had asked me if I wanted to tape a valentine to be broadcast over the weekend of February 13-14. I jumped at the opportunity, although I warned her that mine would be a political valentine. So I taped a valentine which praised one from column A, and one from column B: Senator Specter and President Barack Obama. Friends who valued Specter's courage tried to get through to his office phone lines, but they were jammed. Unfortunately, they were probably jammed with hard-line Republican callers, expressing outrage that Specter had broken ranks with the party faithful. Newt Gingrich and Karl Rove must be delighted. In the words of Chris Matthews, "Senator, you're the last of the Mohicans!" Matthews was commenting on the dearth of progressive Republicans these days. But look at all the health problems which Specter has conquered. He will probably get to win out over the right-wing venom as well. And he has certainly earned a chapter in Profiles in Courage.